3 bedrooms (1 Queen,1 King,1 Super King), 2 w/ walking closets, linens, towels. central A/C and Heat and ceiling fan in living room (3rd bedroom with full bath has separate A/C unit). 2 fully setup bathrooms with tubs/shower. Yard has 6 ft fence all around back yard, private pool (w/ heater available $15 per day ) 3-9 feet deep, several utensils for use. Garden table and chairs, and loungers. Weber BBQ grill. Pick your own coconuts! General: Large living room with 2 small couches. 2 TVs (one in bedroom), DVD players. Alarm system w/ guest code. Also available: folding baby bed, child car seat, 2 fully equipped golf bags. No smoking inside, please. We are a Germany-based family that lives in Florida only 2-3 months a year. We believe that our place is worth sharing. Our bilingual manager lives only a couple of blocks away, keeps the property permanently clean and in shape and helps you in having a great stay. After my parents bought this house in 1997 and went back to Germany in 2010, i soon realized i wanted to keep it for several reasons. We don´t want to be locked up in a gated hotel/spa facility, we enjoy beaches and watersports as much as visiting a big city (Miami), or cultural events (Kravis Center, Harriet Himmel theater). Within 1 1/2 hours, you find everything for a perfect vacation, from a crowded NFL game to the quietness of the Everglades. The only thing you won´t find, of course, is snow. This place lets you feel like a Florida resident, not a tourist. It is cozy and yet large enough for three couples or a family with several children. We always enjoyed the overall quietness and yet closeness to everything. The sound of morning doves in the early hours, getting tanned in the pool. West Palm Beach downtown and city place (as well as Lake Worth and Boynton Beach further south) are offering a large variety of entertainment, gastronomy, leisure, and shopping - without ever getting too crowded. I loved the private back yard area it had lots of sunshine! There were 2 couples staying at the property we had lots of space and enjoyed the amenities provided. Only a few things about the place is the beds come away from the wall with no headboard. Also need to update a few things in the kitchen. But overall a great little house to relax at. Thank you Tammy, your review was very helpful and letting me know that the stove was not working 100% this is the only way we can make our guests stay better. Our little updates are in the works and the stove replaced! Cute house, could use some updating. The property presented even better than what was on the website and the property manager incredibly accommodating with great communication. Thank you. great place, nice pool, private and Slyvia was very nice and accommodating. Enjoyed the pool. Went to Lake Worth beach. Also went to Jupiter often for Cardinals spring training. Also only 5-10 min from airport. Neat bungalow located in a quiet, friendly neighborhood area, close to several beaches. 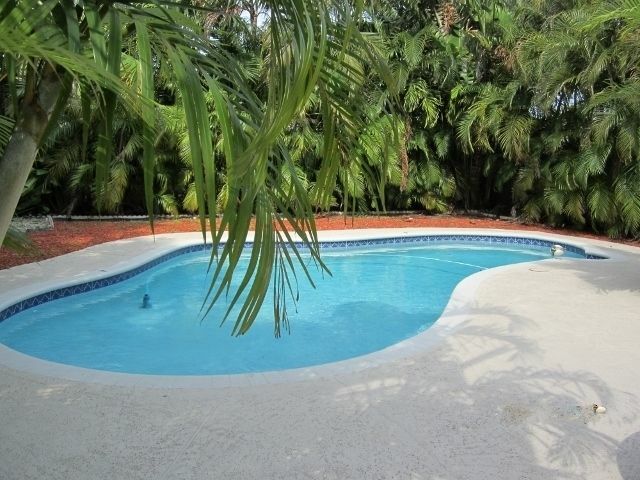 Nice backyard with a large cool deck area and pool, surrounded by palm trees. Perfect for a relaxing pool&beach vacation. Close to downtown and City Place with a lot of bars, restaurants, theater&movie theater. New Outlet Mall and don´t miss every Thursdays live concert on Clematis Rd near Intracoastal, when the city comes together. 1/2 mile away from I-95, this place also serves as a hub for day trips to Miami and Ft. Lauderdale, Everglades, Fort Myers/Naples, popular shopping malls and outlets.